Leo Durocher: Baseball’s Prodigal Son. By Paul Dickson. New York: Bloomsbury, 2017. No doubt, Leo Durocher was a talented baseball player, coach, and manager. He was also MLB’s bad boy before Billy Martin took that title from him in the 1970s. Over a managerial career of more than three decades he oversaw five teams, the Brooklyn Dodgers, New York Giants, Chicago Cubs, and Houston Astros. He won pennants with both the Dodgers and the Giants, and in 1954 he led the Giants to the only World Series championship of his lengthy career, when they beat a heavily-favored Cleveland Indians team in a four-game sweep. Paul Dickson’s biography of baseball’s stormy petrel is one of the best books on baseball to appear this year, and one that will be remembered for years to come. Dickson does an excellent job of bringing Durocher to life. Throughout his managerial career, Durocher was famous for his in-your-face, punch-your-lights-out style of play. He ordered pitchers to deck batters, sometimes to hit them, and often fought with umpires over virtually any play one could imagine. In 1948 Durocher was the centerpiece of one of the most unusual trades in the history of Major League Baseball (MLB). Branch Rickey, general manager of the Dodgers, could not abide Durocher’s antics and engineered in the middle of season a deal with the cross-town Giants to let him take over management of that team. Durocher had his greatest success with the Giants, winning the National League pennant in 1951 and the World Series in 1954. Inevitably, of course, the Giants fired Durocher and he found success in show business in the latter 1950s and early 1960s. He returned to the MLB in 1966 as the skipper for the Chicago Cubs. He should have had remarkable success there as well. During his tenure one of the best teams ever assembled played in the friendly confines of Chicago’s Wrigley Field. The Cubs during those years were perennial favorites to make the postseason. Anchored by three Hall of Fame players—Ernie Banks, Billy Williams, and Ferguson Jenkins—Durocher’s team should have dominated the league. A late arrival to the Hall of Fame, Ron Santo, also played for them. But they never even made the playoffs. During a stretch between 1967 and 1972 the Cubs had a record of 515 victories versus 449 losses. During that time, the Cubs finished second three times and third three times. They did not take a single flag, not a World Series, league championship, or division title. A core question is why the Cubs failed during that six-year period when it looked like on-field talent was in the team’s favor? It becomes obvious from reading this book that Durocher was a key reason for these near misses. Let’s take the Cubs collapse of 1969 as an instance. In April 1969 the Cubs burst out of the gate and no one believed they could be caught. On September 3, the Cubs led the second-place New York Mets by five games, with 26 left to play and more than half of them at Wrigley Field. The Mets caught them, taking 23 of their last 30 games, and won the National League East by eight games. Meantime, the Cubs went 8 and 18. It was a stupendous collapse, one worthy of memorialization in song and story. In the end the Cubs finished second in the National League Central with a 92-70 record, but they were still a distant eight games behind the Miracle Mets. So why did the Cubs collapse in 1969? Durocher deserves major credit for the debacle. He refused to rest his stars, and rode his veterans until they were ready to drop. He also feuded with everyone—many of the players, virtually all the sportswriters, and even the fans. In one famous incident, he nearly came to blows with Cubs star Ron Santo in what could only be called clubhouse riot. Unsurprisingly, Durocher wore out his welcome in Chicago, eventually being fired early in the 1972 season. He latched on with the hapless Astros at the end of the 1972 season and managed them through 1973, finishing with a slightly better than .500 record. Dickson make’s clear that Durocher was a talented manager, but too often a reprehensible human being. He died in 1991, and was inducted in the MLB Hall of Fame in 1994. Two questions about that induction. First, why would baseball writers so honor such a person? Second, why couldn’t they have done it earlier so I could have heard his induction speech. I bet it would have been a doozy. 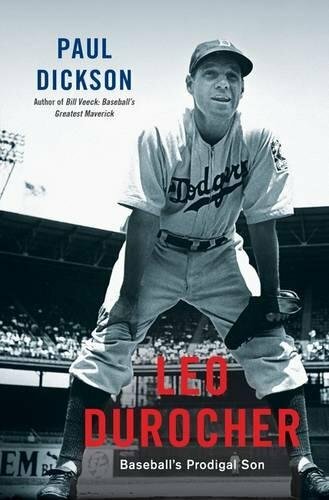 Regardless, Paul Dickson’s Leo Durocher: Baseball’s Prodical Son is a most welcome baseball biography. Enjoy! This entry was posted in Baseball, History, Sports and tagged baseball, Billy Williams, Bloomsbury, Branch Rickey, Brooklyn Dodgers, Chicago Cubs, Ernie Banks, Ferguson Jenkins, Hall of Fame, History, Houston Astros, Leo Durocher, Leo Durocher: Baseball’s Prodigal Son, MLB, New York Giants, New York Mets, Paul Dickson, Playoffs, Ron Santo, World Series, Wrigley Field. Bookmark the permalink. I learned facts about this incredible man that I never knew before. Looking forward to reading future posts.